I Cover Movies Old and New. The film Roma Directed by Alfonso Cuaron is a great example of why directors need separate cinematographers to tell the story. 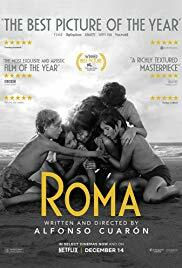 Roma is a great premise with interesting characters that fails to deliver. It’s failure is due to long exaggerated scenes with too many wide-angle long shots and slow panning. The story crawls due to the passion of the director to get everything according to his vision. The viewer is left bored after beautiful scenes become exaggerated and tiresome. The story of Roma is one a maid named Cleo for an upper class family in the city of Roma who’s internal struggles dominated her life. The maid spends a lot of time cleaning up messes who physically and emotionally while always being shown as distant or less than the family she’s so crucial to. Where Alfonso goes awry is in the incorporation of political unrest specifically the crib shopping scene which was an unnecessary addition to the already long story. This along with other elongated stretched out scenes serve as examples of trying to pack too much into a story weakening it as a whole. Despite its numerous nominations and awards including best cinematography, the movie fails to deliver. The cinematography becomes grading and boring really quickly as the camera moves like a confused fly on the wall between critical arguments and scenes. Of all the films nominated for Best Picture for the Academy Awards this is one least deserving of the nomination. Tully could be described as many things but I failed to see the goal of the movie to entertain you through laughs. Calling Tully a comedy and using the word hilarious to describe it makes me question if I watched the same movie. While the movie has some strong points of interests there were a few things that completely pulled me out the movie. The style of Tully is dark and moody. The film has a dominant high contrast desaturated look to it. It focuses heavily on the mental breakdown of a mother struggling to raise 3 kids. Don’t expect any deep belly laughs in what could best be described as a drama with comedic elements solely to break tension. Be prepared for some shaky handheld cinematography and awkward camera angles.There is one scene where Marlo’s foot is framed towards the front of the camera like an homage to Tarinatino. Tully also uses a lot of jarring jump cuts that makes the overall feel of the movie jarring and uneasy pulling away focus from the story itself. The scenes lose rhythm as they bounce with no cadence between each other in a collection of puzzle pieces from several boxes at Goodwill attempting to become something beautiful. The performances of the actors in this movie is the strongest argument for its merits. Charlize Theron gives us a strong and often sympathetic look into the trials of motherhood as Marlo. Tully played by Mackenzie Davis is the night nanny hired by Craig to help Marlo get through the night. She was definitely well executed in this role. Her husband Drew is delivered really well as a clueless husband who doesn’t see the warning the signs of frail and exhausted Marlo due to his focus on the other kids and attempting to hold on to his own sanity. It’s strong support casts including Mark Duplass as Craig Marlo's brother are the main reason to watch this depressing and jumbled mess of a movie. Over all it fails as a comedy but due to its strong casting and performances it becomes a mediocre drama. Seeing someone struggle with Postpartum issues and mental breakdowns in graphic detail doesn’t strike me as funny and they don’t portray it as such. Seeing a mother struggle with a son with mental health issues while dealing with her own demons also isn’t humorous either. There are some moments of comedic elements scattered about with the plot points and unresolved story arcs. Don’t expect jokes with set-ups, physical comedy one liners or punchlines. Expect a hard hitting drama with an odd flow and awkward execution. There a lot of stylistic pitfalls that are only tolerable from the strong acting of the cast. All the weight was put on the cast to carry the movie to to it's unsatisfying completion. Rotten Tomatoes is so popular these days that the scores are listed on streaming devices and used as a standard unit of measurement for film-goers and couch-surfers alike. But, just like books can’t be judged by their cover, these films can’t be judged by their critic scores either. I think you be entertained by the 5 movies below, so I implore you to view these films yourself and ignore the Rotten Tomatoes score. A 90’s teen action movie based around the mysterious world of underground hackers. This film has it all, from a great ensemble cast starring Angelina Jolie, Johnny Lee Miller and Matthew Lilard to the youthful rebellion against corporate corruption. It delivers an awesome message about the power of hackers and served as a cool cyber-punk introduction to many teens at the time. Hackers was just as influential as it was entertaining. The Last Witchhunter in many ways is the Dungeons and Dragons film I have always wanted. It’s an action adventure fantasy loaded with intense imagery, magic and Vin Diesel. I like to think of it along the lines of a modern Highlander or Willow. Just like the aforementioned movies it’s flaws can be easily looked past. While the former are considered classics don’t be surprised if this one gains cult status as time progresses. When you have Arnold Schwarzenegger, Phil Hartman and Rita WIlson in a movie it can do no wrong. This great casting of a kids movie shows the darker side of the holidays and consumerism. Any movie with Arnold fighting an swarm of Santas making cheap counterfeit toys is easily the best thing you will watch on your screen. For me, Jingle All the Way is the one holiday film I return to each year. Phil Hartman steals nearly every scene in this absurdly funny Christmas classic. This movie balances the pure charm of wacky, family fun with adult themes that keep it the story entertaining, while going over the kids heads. Loosely based of a comic book this fun action film starring Jeff Bridges and Ryan Reynolds is definitely worth a viewing. Highlights include the special effects, which border on cartoonish and gives this film a more comic book feel, with great casting and a unique blending of two worlds experience. There are some fantastic actions sequences, and the chemistry between Jeff and Ryan keeps it up the pace and interest through the entire movie. A mixed visual arts spectacle that pushed boundaries. This film is at times is cringe worthy, but overall well executed. It’s plot isn’t quite linear, as it flows like a lucid dream with intentional gaps allowing for interpretations and a general uneasiness for the viewer. This is a polarizing film for audiences with its fans and it’s haters alike. While critics were quick to dismiss it, I enjoyed it and think it’s worth a showing.